Meghalaya as you know is a part of north-east India. Meghalaya is popular for beautiful locales including forests and is also the home of many Indians including Garo tribes. In the 3rd week of September 2014, flash floods brutally swept away many villages in the Garo Hill districts of this beautiful state. 6 lakhs have been affected. Lives, livelihoods, homes and schools lost in minutes. Whole villages washed away, leaving little or no trace behind. Those who have survived are getting by on bare essentials. Our on-ground assessment teams have conducted surveys in the affected areas and found needs to be dire in several villages. Over 2656 families in West, North and South-West Garo hills in Meghalaya need your attention and immediate help. We have partnered with Bakdil (www.socialworkbakdil.org) & VHAM - Voluntary Health Association of Meghalaya (www.vham.in), both well-respected organizations with solid community standing. They are on task to buy relief supplies and essentials locally and distribute them to the flood-affected people. In a survey by our ground coordinators accompanied by the local block development officer have identified two immediate essentials which are described below. A major issue hindering the children in Garo Hills is the lack of adequate electricity supply. Kerosene oil lamps are unsafe & expensive; candles inadequate.The absence of light will negatively affect children's studies. Our endeavor is to provide one solar energy study lamp each to 3000 children identified in the affected schools. Further, we believe that disaster relief and rehabilitation should be culture specific and gender sensitive. Women and children specific needs are often ignored or are non-prioritized during disaster relief operations. The community in Garo Hills is matrilineal and tribal in nature. The women here wear a traditional outfit called dakmanda, a sarong dress. The dakmanda sarongs can only be made by fabric weaved locally. They have a specific length and pattern. When the relief started to pour in, the men and children got appropriate clothing but the women received alien garments, which they simply could not wear. We are planning to distribute dakmanda to the women in worst affected parts of the area soon. For this, we need your generous support. Your contribution can directly impact this region and its people. Please come forward, lend a helping hand and rebirth a land! V.O.I.C.E. 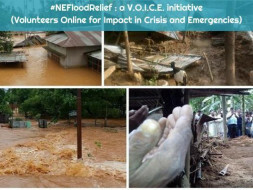 stands for Volunteers Online for Impact in Crisis & Emergencies. We are a group of volunteers that organize rescue and relief coordination efforts during natural disasters. We have contributed to relief efforts during floods in Jammu & Kashmir (2014), Uttarakhand (2013), Phailin (2013) and now in North East India (Assam and Meghalaya). To learn more about us, click on the icons below.